CALGARY - Rene Paredes did his job in overtime and then Tommie Campbell sealed the deal. After Paredes kicked a 42-yard field goal, Campbell picked off a Jonathon Jennings pass in the end zone to earn the Calgary Stampeders a thrilling 44-41 win over the B.C. Lions on Friday night. "I just couldn't believe it at first,'' said Paredes, who finished the game with five field goals. After his game-winning pick, Campbell fell to the ground and was mobbed by his appreciative teammates. "We didn't want to leave it in nobody else's hands so we took full advantage of it and I came down with the play and we won the game,'' said the rookie defensive back. 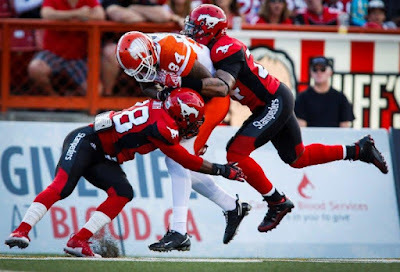 Trailing 41-26 late in the fourth quarter, the Stampeders (3-1-1) rallied with two touchdowns and a two-point convert to tie up the score and send the game to overtime. "I noticed a couple people leaving,'' said Calgary coach Dave Dickenson in regards to several of the 27,651 fans in attendance at McMahon Stadium heading for the exits when the Stamps were down by 15 points. Quarterback Bo Levi Mitchell started the comeback by leading the Stamps on a seven-play, 94-yard drive that culminated with a 42-yard touchdown pass to Greg Wilson, his second TD of the game. Stamps cornerback Ciante Evans then picked off an errant pass by Jennings and ran it back 18 yards to the B.C. 32-yard line. Two plays later, Bakari Grant hauled in a 12-yard TD pass from Mitchell, who promptly tossed a strike to Anthony Parker in the end zone for a two-point convert to make it 41-41. Mitchell went 29 for 44 for 364 yards, three touchdowns and an interception. Tory Harrison ran for a TD for the Stamps, while Rob Maver booted a single. Despite the loss, Jennings had a great game for the Lions (3-2) as he completed 26-of-41 passes for 374 yards, three touchdowns and two interceptions. Shawn Gore, Bryan Burnham and Geraldo Boldewijn hauled in the TD passes from Jennings, while Chris Rainey returned a punt for a touchdown and Richie Leone kicked a field goal and two singles. "All we came in here to do was win and we couldn't get it done,'' said Burnham, who led all receivers with 139 yards on nine catches.